Today’s post can be found at http://magicalwords.net, the group blog on the business and craft of writing fantasy that I maintain with fellow authors Faith Hunter, Misty Massey, Mindy Klasky, John Hartness, Kalayna Price, and James Tuck, among others. The post is called “On Creativity: Narrative, Fiction, and Life” It is a special post, written on a very special day in my life. I hope you enjoy it. Today’s post can be found at http://magicalwords.net, the group blog on the business and craft of writing fantasy that I maintain with fellow authors Faith Hunter, Misty Massey, Mindy Klasky, John Hartness, Kalayna Price, and James Tuck, among others. The post is called “On Writing and Creativity: Who Are Our Characters?” In it I discuss the work I do to give my characters personalities, emotions, and even opinions that are unique, and not at all my own. I hope you enjoy the post. Tomorrow, May 7, my good friend Stephen Leigh is coming out with a new book. All right, actually he is coming out with an old book, but chances are it’s new to you. Stephen has been writing professionally since 1975 — I think he sold his first story when he was, like eight years old. And he has been producing thoughtful, elegant fiction ever since. In 1981, he published the first book of his ‘Neweden’ Trilogy, SLOW FALL TO DAWN. It was followed by DANCE OF THE HAG (1983) and A QUIET OF STONE (1984). 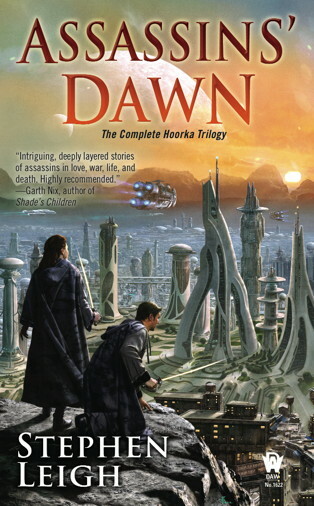 These three books are now being reissued by DAW in an omnibus called ASSASSINS’ DAWN. Briefly, the series is about a guild of “ethical assassins” on a world called Neweden, where assassinations and violence are tolerated. One of the assassins wishes to expand the guild’s reach to other worlds where its peculiar practices might not be so welcome. For more, please check out Steve’s site. I should add that Steve is not only a marvelous writer, but is also one of the finest people I have ever met. I hope that you’ll check out his “new” old books. And while you’re at it, you might want to check out some of his more recent work as well. Thanks.